Te Kohe Tuhaka (playing Michael James Manaia) is a performer who combines the agility of an acrobat with the delivery speed of a bullet train. And yet, the speed of delivery in no way hampers an audience’s understanding – in fact it accelerates a rate of comprehension because of Tuhaka’s versatile characterizations. Playing not only the main character (i.e. 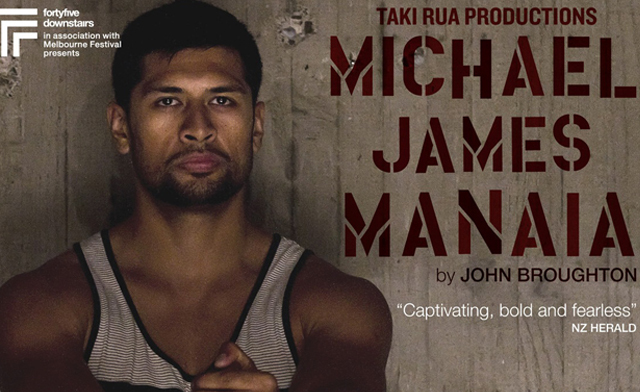 Michael James Manaia) Tuhakaalso gives a stellar performance as his brother, father and girlfriend – relying on voice and physicality with the barest of costume changes. A highly commendable performance by both an actor and director who recognize the value of breath, pace and language in creating multiple levels of layered textual and physical meaning. Within the intimate space offered by fortyfivedownstairsDaniel William’s set is simple and evocative. Through a range of levels we are introduced to different scenarios and these complemented by a carefully crafted soundscape by Maaka McGregor and suitably subtle lighting design by Lisa Maule. It is a credit to Lees’direction that the aesthetic of the work is so well melded together – there may have been occasions when moments of silence would have allowed the audience to cradle certain experiences better; but overall the pace and energy of the production is near-perfect. The most important aspect of this production is Michael James Manaia’s commitment to interrogate and question how perception is not just that of an outsider looking in – often the most critical persona is the self. An exemplary production and a true asset to the 2012 Melbourne Festival. Watch, listen and revel in the magic that Michael James Manaia brings to Australia.